Come aboard onto a ride in the world of programming with our course on technology fundamentals. It is designed for beginners and also caters to learners who want to brush up on their basic programming skills. The course contains 9 levels and builds a strong foundation in programming, using C language. We help you understand programming concepts with the help of real life examples and scenario-based learning. The course offers step by step learning using animated and whiteboard videos, multiple choice questions, interview questions, exercises, industry best practices, tricks to avoid errors and some interesting facts about programming. 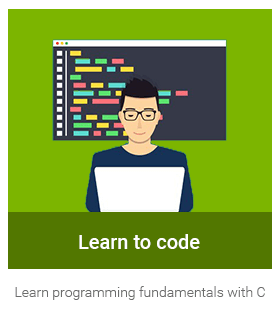 Learn to Code is a comprehensive e-learning course on Programming Fundamentals. The course contains 9 exciting levels that builds your logic and make you an expert in programming. Understand the logic required to write programs with Programming basics, Applications of programming, Programming flow and process flow of programming. Understand and define variables. Decide the data types based on requirements of program like meaning and scope of variables and data type categories. Writing programs in C using variables, calculations and interactivity. Study about the building blocks of C program – Preprocessor commands, functions, Comments; Compilation and execution, Declaring variables, statements and expressions, Writing interactive programs. Write programs that enable decision making, using the conditional statements in C like If..else..endif and Switch..case. Manage programs with repetitive code using loops in C like While, Do..while and For. Write programs that store and retrieve data using arrays. Study meaning, declaration and initialization of arrays, types of arrays and its usage. Study advanced programming techniques that store and retrieve data of different data types, using data structures. Here, you study meaning, definition, declaration and initialization of data structures. Reiterate all the concepts and write programs in C. Incorporate best practices of the industry in your programs. Also learn interview preparation techniques.